Zen del Mar, a stunning masterpiece of a luxury villa. This amazing villa offers every luxury one could desire for a special holiday on the Mexican Caribbean. The owners of Zen del Mar have designed this villa after years of providing luxury rentals at their adjacent villa, Casa del Sol Naciente. They have thought of every detail in creating this amazing custom-built luxury vacation home! 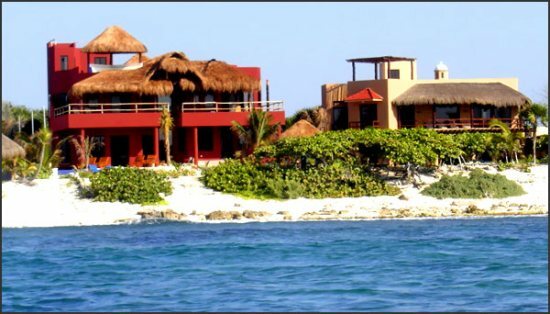 Zen del Mar is a spacious five-bedroom, 6.5 bathrooms, beach-front vacation home that sleeps 10 to 14 people. It was designed to give breathtaking views of the sea from all rooms while maintaining an ambiance of private intimacy inside its soulful interior spaces. General layout The palapa roofed entranceway soars 25 feet high to reveal the natural stone Mayan archway inviting you into the villa and its marriage of the indoor outdoor Living and Dining options. Walk into Zen del Mar on the handmade Mayan terra-cotta tile floors and your eye goes straight ahead to the soaring 25 foot high glass window framing the Caribbean seascape. The large indoor dining room opens to the adjoining outdoors covered dining area. The spacious kitchen consists of a serving area with a cocktail bar breakfast bar with stunning views of the sea, two sinks and a dishwasher, a large cooking area with state-of-the-art restaurant-style amenities. There is a roofed outdoor kitchen with grill, refrigerator and service area next to the kitchen and the outdoor dining area. The kitchen is equipped with two sinks and appliances that include a dishwasher, an oven, a toaster oven, a microwave and a blender. Upon arrival, refrigerator is stocked with soft drinks and cold beer. Condiments and cooking staples such as sugar, salt, spices, sauces etc. are replenished by the staff. Restaurant quality dishes and utensils are provided. Bottled drinking water is provided and refreshed daily by the staff. Chef service is available upon request, to be coordinated with the Hospitality Manager. The sunken living room has a seating and entertainment area. The living room has TV with satellite service that includes American news channels as well as several movie channels. The entertainment center also allows viewing the library of 30 DVDs and VCR videos. Music CD's are played on a 5-Disc changer with four sets of inside and outside speakers. Outdoor barbecue kitchen Zen del Mar has a full outdoor kitchen / grill area located right outside the main kitchen food preparation area, where you can prepare full meals grilled. Grill Fresh Fish or a meat of your choice on the 4 foot built-in charcoal barbecue and serve the meal on the built-in bar next to the grill, directly overlooking the outdoors dining room. The 60 foot lap pool is a swimmer's delight with an infinity edge, a waterfall cascading onto a bench at the infinity edge and two lounge chairs built in to the pool. The pool is perfect for family play, lounging in the water and swimming laps. Custom-built hardwood lounge chairs grace the pool edge and the separate sand lounging area. Spa services have a home in the Zen spa palapa. The secluded elevated 300 square foot palapa is home for Spa privacy overlooking the pool and the sea. The Spa Palapa has a shower and bathroom. This can be a perfect hideaway to read a book or nap for non- sun lovers. Ocean kayaking on calm days you may take out the two 2-person ocean kayaks. For snorkeling, Jade Beach is a snorkelers paradise. Bedroom suites and balconies The villa has five king sized bed suites. The second floor has a foyer with seating for two overlooking the ocean through the 25 foot high glass window. All bedroom suites have hand made hardwood double-doors. Each room has a mini-refrigerator, a safe and a satellite TV. The bedroom suites range from 320 to 420 square foot in size. All five bedrooms have fine bed linens from Europe at 400 plus thread count sheets. Two of the six bathrooms have Mayan stone bathtubs with glass block walls providing both light and privacy. Showers in the other bathrooms have a view of the sea. Covered terraces off the bedrooms have breathtaking views and privacy.